Syria’s embattled President Bashar al-Assad addressed the nation for the first time in two months Monday, delivering speech that lasted for more than an hour in which he called for talks but blamed some of the violence on “saboteurs.” Assad also called on the thousands of refugees from northern Syria who have crossed the border into Turkey to return, assuring them that the government would not exact “revenge” on them. (Watch excerpts of the speech here). [The] speech appeared to again fall short of activists’ demands as protests erupted around Syria, including in the suburbs of Damascus, the capital, shortly after his address, activists reported. Assad, who floated the idea of allowing other political parties into the government, lifted the country’s decades-old emergency law in April, but security forces have carried out a harsh crackdown in cities across the country. Foreign media have not been allowed in the country, but estimates by human rights groups show as many as 1,400 people have died and 10,000 have been imprisoned. The speech seemed to have little impact on protesters or opposition groups, which are calling on Assad to leave office. The governing body known as the Internet Corporation for Assigned Names and Numbers, or ICANN, has increased the allowed number of suffixes for web domain names and said it will begin accepting applications in 2012, with corporations and large entities among the first to be considered. There are currently 22 domain endings — such as .com, .edu, .gov, .net, .org — and approximately 250 “country-level” doman names, such as .jp or .uk. ICANN has previously allowed new domains on an incremental basis, but the scale of the new suffixes would be unprecedented. Applications for these names would cost around $185,000, not including annual costs. Thousands more residents have been evacuated after wildfires in Arizona, aided by dry weather and winds of up to 60 miles per hour, pushed across a highway. Approximately 10,000 people have been forced out of their homes. The blazes have been up to 27 percent contained, but crews suffered setbacks Sunday, with flames jumping established fire lines. There are several large wildfires in southeastern Arizona and New Mexico, including the three-weeks-old Wallow fire, which has consumed more than 500,0000 acres, including large swaths of the Apache-Sitgreaves National Forest, and the Monument fire, which caused the latest round of evacuations. 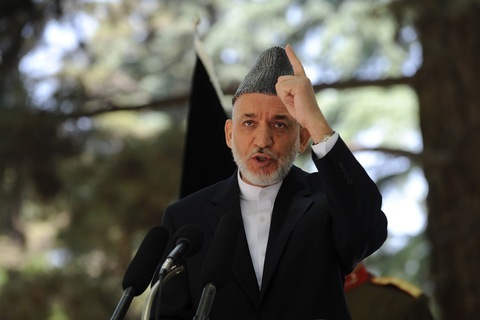 Afghan President Hamid Karzai speaks during a press conference at the presidential palace in Kabul on May 31. Karzai warned that the U.S.-led NATO military in Afghanistan risks becoming an “occupying force” if aerial bombings which cause civilian casualties continue. Photo by Shah Marai/AFP/Getty Images. U.S. Ambassador Karl W. Eikenberry said in a speech to university students in Herat, “I must tell you that I find occasional comments from some of your leaders hurtful and inappropriate,” presumably a reference to Afghan president Hamid Karzai’s comparison of U.S. forces to occupiers. In recent months, Afghan President Hamid Karzai has stepped up his criticism of NATO forces for civilian deaths and over the weekend revealed that U.S. representatives were in some form of peace talks with members of the Taliban. Afghan leaders appear torn between a fear of losing U.S. military and economic assistance and resenting their dependence on it, and Karzai has become increasingly outspoken in criticizing U.S. actions. Eikenberry is preparing to leave Afghanistan after a two-year tour and at a time when President Obama and military leaders are looking to set the number of troops to withdraw beginning in July. There has been pressure from Congress and the public, especially because of budget and economic concerns, to withdraw troops at steep numbers. “When Americans, who are serving in your country at great cost — in terms of lives and treasure — hear themselves compared with occupiers, told that they are only here to advance their own interest, and likened to the brutal enemies of the Afghan people…they are filled with confusion and grow weary of our effort here,” Eikenberry said. In the wake of the severe damage sustained by Japan’s Fukushima Dai-ichi nuclear plant in the March 11 tsunami and earthquake, Yukiya Amano, head of the International Atomic Energy Agency said “business as usual is not an option” and called for a global review of nuclear safety standards. His comments came as 150 nations met in Vienna to discuss new safety rules and whether or not they should be mandatory. Amano has proposed that new standards be implemented and countries reviewed for compliance by the IAEA itself. “Many countries have accepted (peer reviews) already; European countries, Japan, the United States. I would like to expand it, so that all nuclear power plants will see a peer review on a random basis,” Amano told reporters.